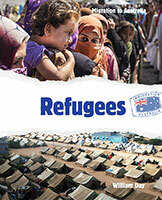 Australia has welcomed refugees and helped them to settle since colonial times. As Australia confirmed its place in world affairs after the Second World War, it accepted thousands of people who were escaping the ruined cities and social upheaval caused by the war. After the fall of Saigon, thousands of Vietnamese refugees came to Australia, and the current unrest in the Middle East has resulted in many more people seeking a safe sanctuary. Find out about Australia's responses to people arriving as refugees, from colonial times up until the present. Read about the contributions refugees have made to Australia and the challenges they have faced.